Who told you that there are no spies in the world of animals? This bear is a professional forest spy, and tonight he went to complete an important secret mission. Help him to shoot down all guards and to accomplish his mission in this free online game! Are you ready? 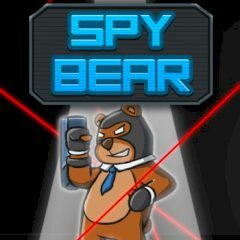 This bear is a young but very talented spy. You must help him to accomplish a brand new serious mission to eliminate a dangerous person. He has a lot of bodyguards, looks like they must be eliminated too! Are you ready to show everything you can in this free shooting game? Everything will depend only on you – so be precious and try to act as quickly as possible to earn extra ponts in this game developed by Arcade Bomb!